The modern workplace is challenging. Keeping connected as a team and collaborating on projects is hard work. Although many of us enjoy great benefits that allow us to work from home and travel, it can be difficult to stay connected and current when you’re not in the office. It's also hard to collaborate on complex problems and work on projects together in a distributed environment. This can be challenging whether someone is just down the hall, or in another country. Great tools are emerging out there to make our lives easier, and Slack is a popular tool in this space. Slack makes messaging simple and allows users to spark up quick audio or video chats. You can also easily share files and information. But as you would know if you’ve ever tried to find a document someone shared on Slack weeks ago, it can be a chore. It’s difficult to remember which channel you were in, and the search feature brings up 28 documents with the same name. There are many reasons why Slack is great, and many reasons why it may not be a great fit for your team. Slack may not be in your budget, or you may have governance or business reasons why it simply doesn’t work. With that in mind, we’ve considered a list of alternatives, and focused on applications that have both desktop and mobile support. Try testing a few of these out and see if the features and functionality are the right fit for your team. 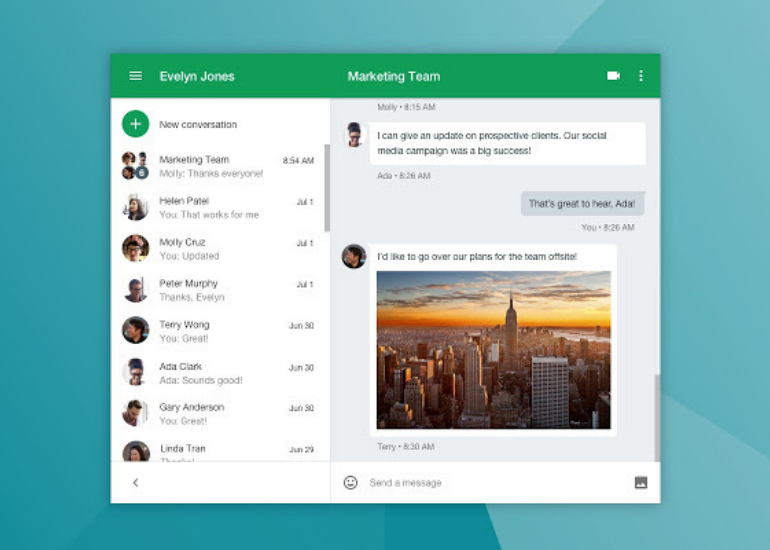 Google Hangouts is a common tool for video chat and messaging. It’s great to spark up quick video conversations, share your screen and take some notes in a Google Doc alongside. 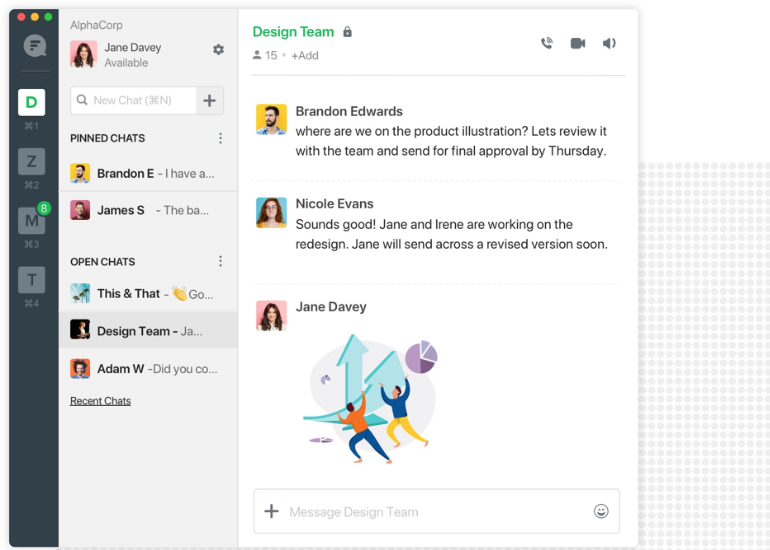 It has integrations with HipChat, UberConference and ZenDesk and other Google Apps. Mobile apps work well, and offer the majority of the functionality of the desktop versions. 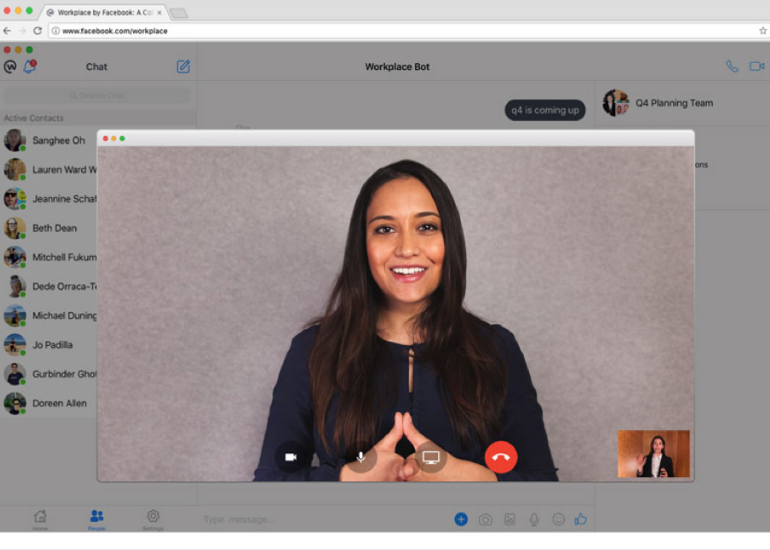 Cisco Spark is a cloud-based tool that focuses on team collaboration and provides a mature video chat and excellent messaging. Features include meetings, messaging, video and voice calls, whiteboard and document sharing. Cisco is a great choice if you want to get hardware in your office to improve the quality of video chat. The desktop and mobile tools also have high quality apps and experience that users rate highly in reviews. Bria Teams is a powerful collaboration tool that provides a unified communication platform for your team across desktop and mobile devices. The powerful tools in Bria softphones make it easy to discover and connect with team members using a variety of features in a contact-centric interface. 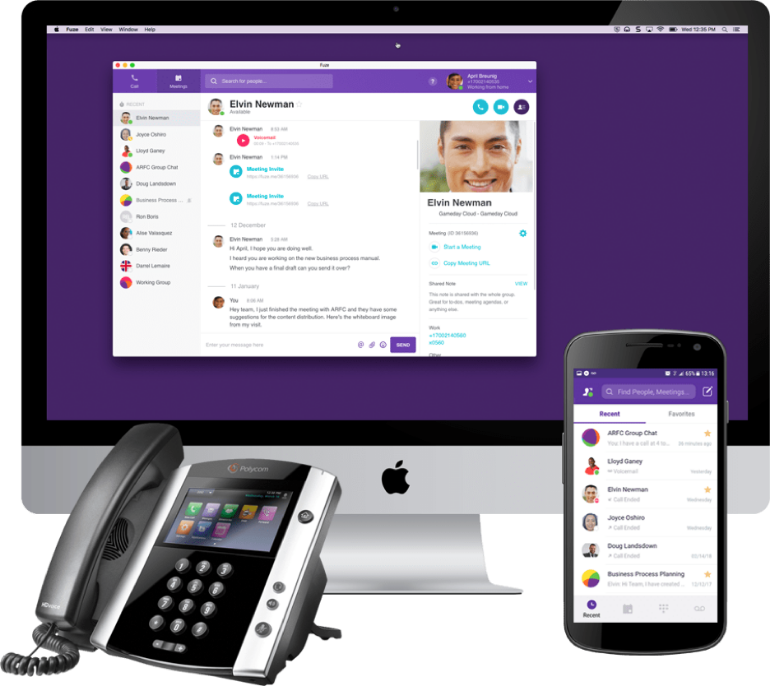 All the core features are included: messaging, presence, HD voice and video calling, PBX integration, as well as screen sharing and file sharing. Team voice and video capability enables you to communicate instantly with team members without having to setup a call server or phone service. 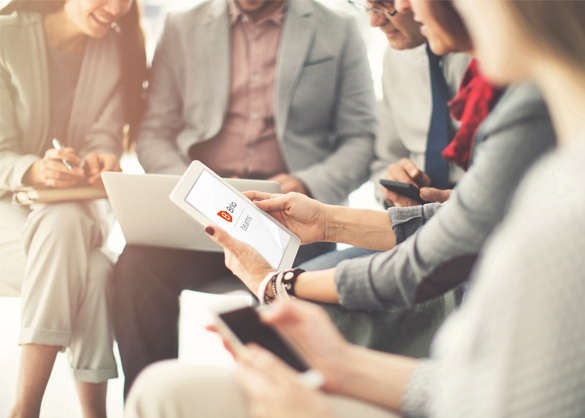 If you’re looking for a highly secure way to connect your team and digitally transform your communications, download Bria Teams and get your team talking within minutes! Fleep is an open network so you can chat with anyone else who is on Fleep. You can send a message to anyone via their email address and invite them into the conversation. This tool is flexible and allows you to create your own team, much like a Wolfpack from the people you need to get your project across the finish line. Fleep features unlimited message history as well as unlimited integrations (including appear.in) in the free package. 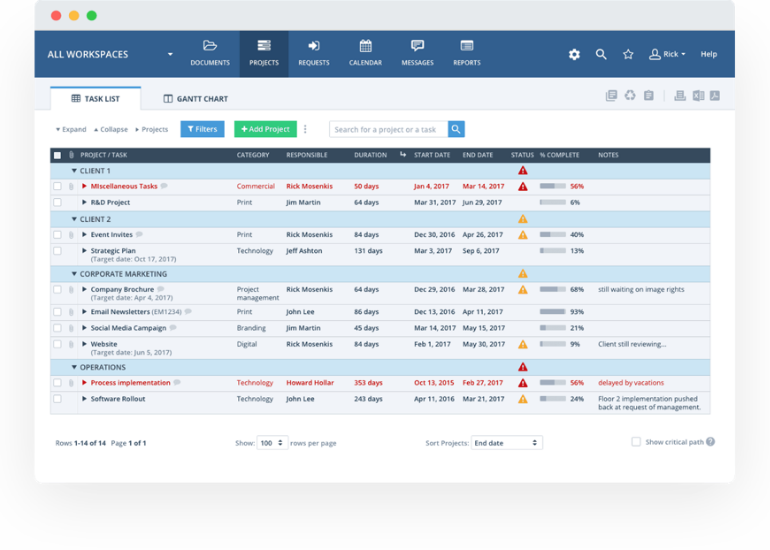 Although this is a project management app at its core, Workzone has powerful collaboration capabilities such as file sharing, comments and email notifications. Collaboration centers on a team calendar and to-do lists, so your whole team knows who’s working on what. Workzone allows you to fix your goals and tasks to a firm date in a calendar and communicate well around the status of tasks. Ryver is a good fit for small businesses, as it has unlimited messages and posts, , forums and storage. 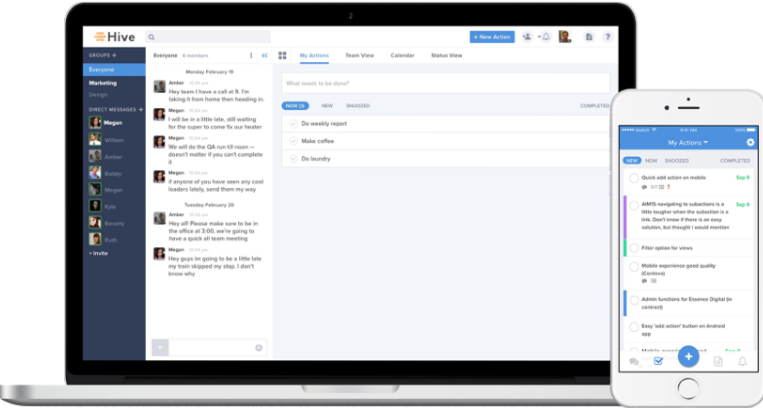 Flock features group chat, video and audio calls, screen sharing, polls, reminders, notes and to-do lists. 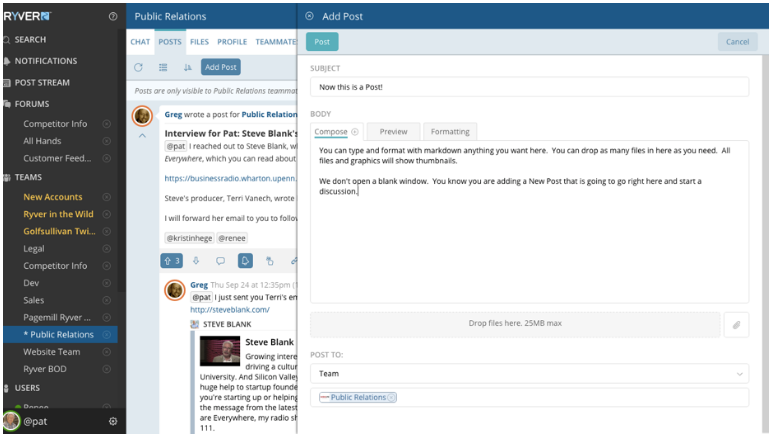 Flock provide team collaboration but also dips a toe into the project management space. Notably Flock supports multiple languages in its interface including Portuguese, Russian and Spanish. The 5 column interface of the desktop version provides a power user interface, but many users identify it’s overwhelming to get used to. Flock integrates with Google Drive, MailChimp, Dropbox, Jira, Trello and many more. 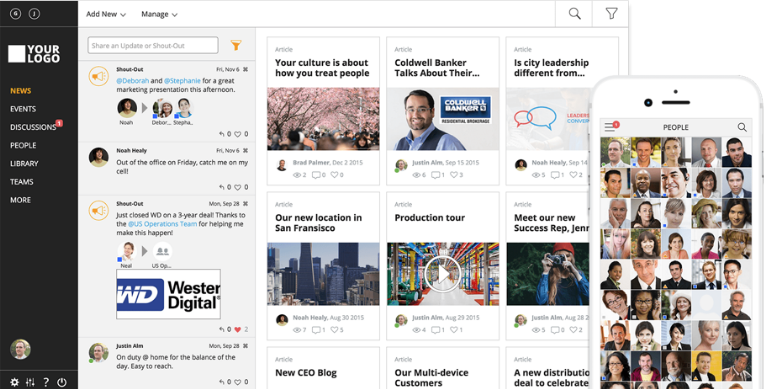 Jostle is a cloud-based People Engagement platform, or as they use to call it in the late 2000’s an intranet. Jostle is a great place to collaborate on discussions, forums, events and groups, but does not feature audio or video chat. If your focus is supporting a membership group and managing events across a wide organization, and don’t need to connect to talk, it’s a great toolset. We all know how hectic it can be to keep up with the flood of messages from email, texts, IMs, and notifications at work. 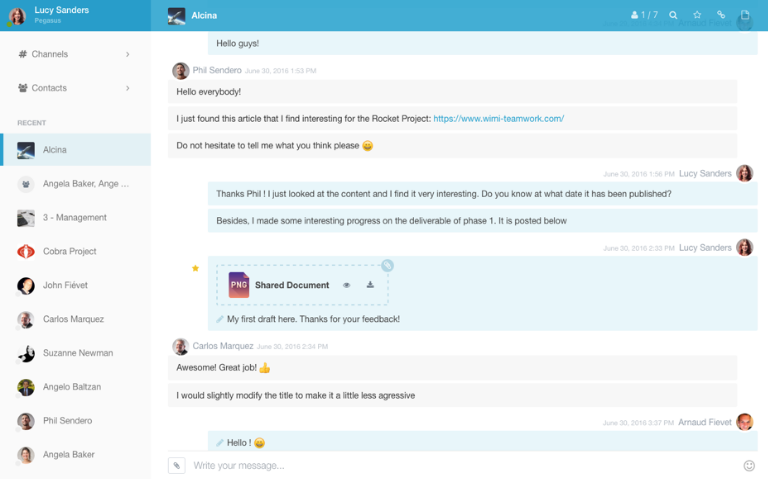 Twist is a teamwork and collaboration tool that seeks to foster mindful communication and provide a central location to grow a knowledge base and have organized, on topic conversations that are accessible to everyone. If you like focusing on tasks head down, but want to participate in a discussion around complex ideas and projects when it’s the right time for you, not when the notifications blaze across your screen, then you should explore Twist. Wimi provides a complete digital collaboration toolbox that helps make teamwork more efficient and keeps you organized. Providing a full selection of services, from messaging channels, files & drive, tasks, calendars and video conferencing, your entire team can collaborate and work smarter together. You can bring clients and contractors into project collaboration through a refined access-rights management so you can choose what data to share with your internal team and external partners. One of the negatives users note is that the mobile tools are not fully featured, and the calendar is the feature they miss the most. If you like everything in one place, you may like Hive. 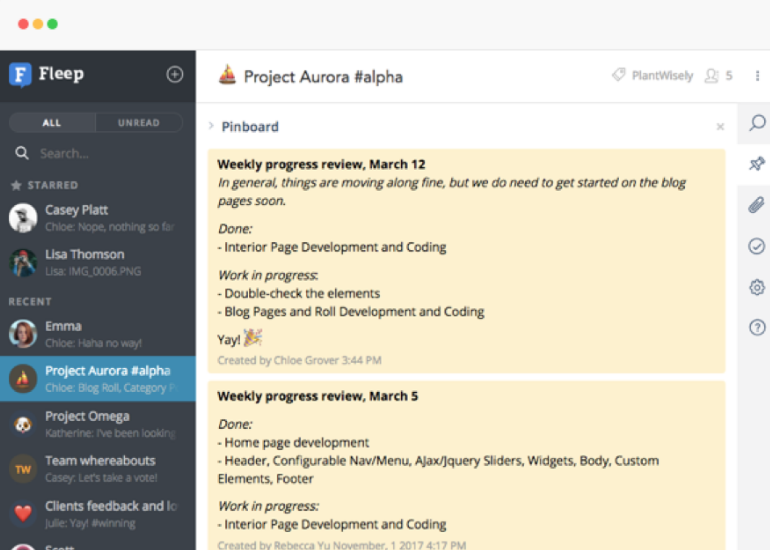 Your team to-do list, your conversations and you files all live on the same page. Everything you need to focus on is organized and pulled together for you, including Google docs and integrations with other file sharing systems. You can integrate with Slack and over 1000 other tools to connect all your work into one place. 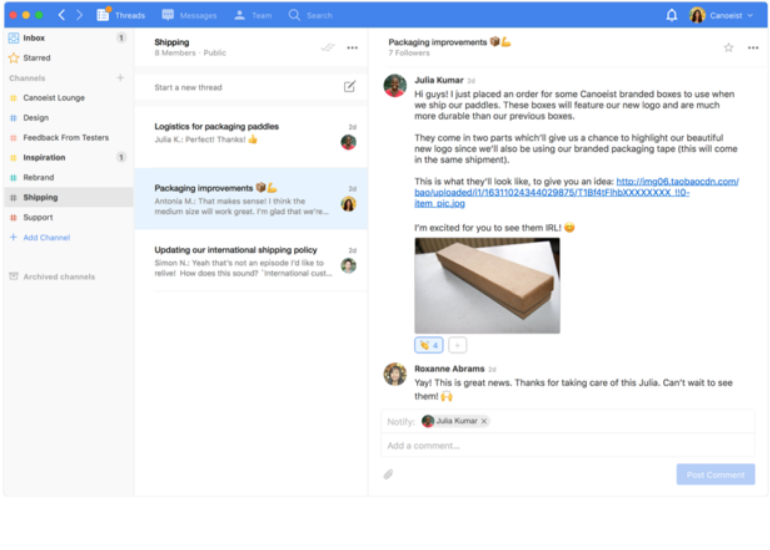 Facebook has put a lot of time and attention toward creating a suite of tools especially for collaboration on teams. The familiar interface of Facebook allows you to create groups and host live chats with your team, and include others who are on Facebook. If your partners, collaborators and clients are all on Facebook, then connecting them into your conversation for quick collaboration is easy and click. The mobile and web interfaces have the responsiveness and elegance that you are familiar with on the personal version of Facebook. 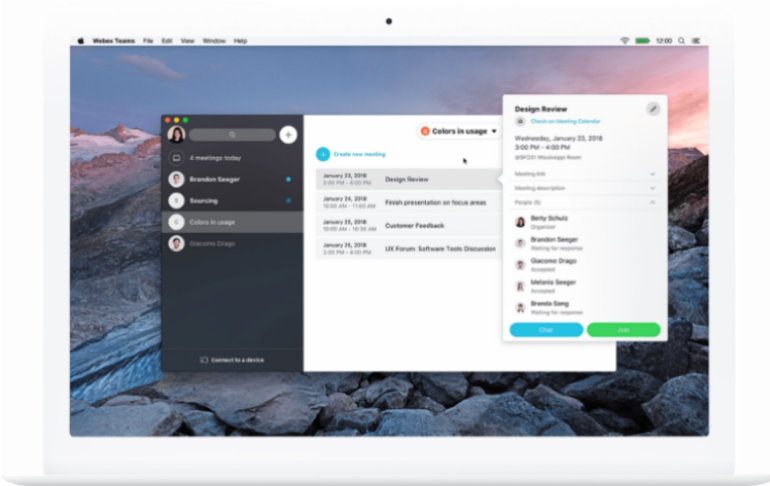 If you’re looking for an all-in-one app for business collaboration that features voice, messaging, video, call routing, integration with Google, Box, Microsoft Outlook and many more integrations then you should consider Fuze. Focusing on Unified Communications so you don’t have to support multiple apps and services for team collaboration, Fuze provides a streamlined and familiar user experience so you can spin up a video chat, whiteboard out an idea or make a quick phone call, from your desk or wherever you are. Fuze also provides insights and metrics for administrators who need to track quality and performance. As you can see, there are many alternatives to Slack that could work for your business. We hope one of these tools will help you on your way to improved productivity!